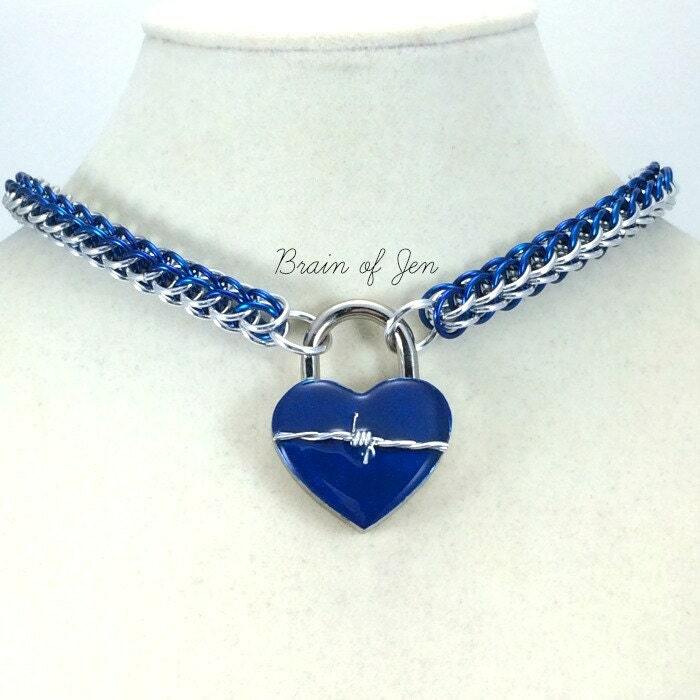 This unusual and intriguing slave collar is hand crafted with shiny, high-quality anodized aluminum rings in shiny, bright silver and vibrant cobalt blue, in the smooth and sleek chainmaille pattern known as the Full Persian or Fox Tail weave. 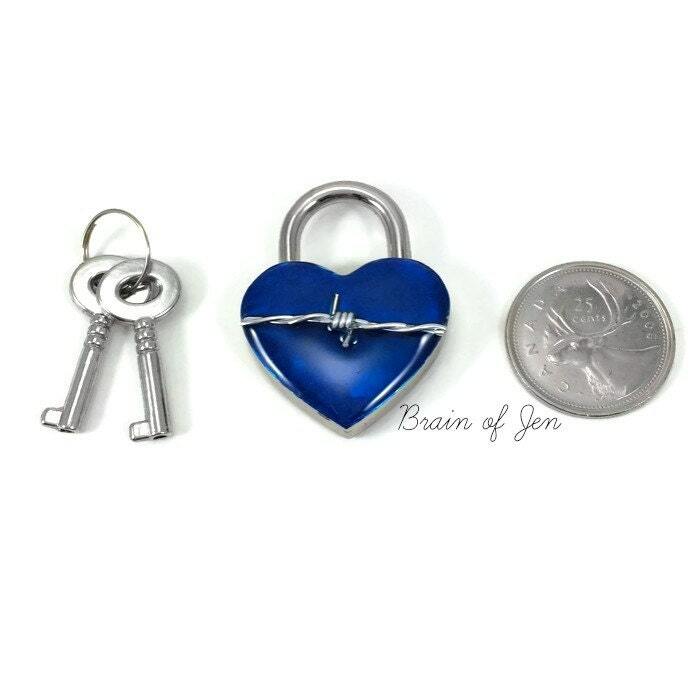 It closes in front with a nickel silver heart shaped padlock. The front of the lock is painted in a shimmering royal blue, and adorned across the front with a small length of silver barbed wire. Please note that this is *actual* barbed wire, and while the ends have been filed, it can still catch on fabrics, and will leave marks if pressed against the skin. Please exercise caution! I use pure aluminum rings due do their lightweight feel and durability. 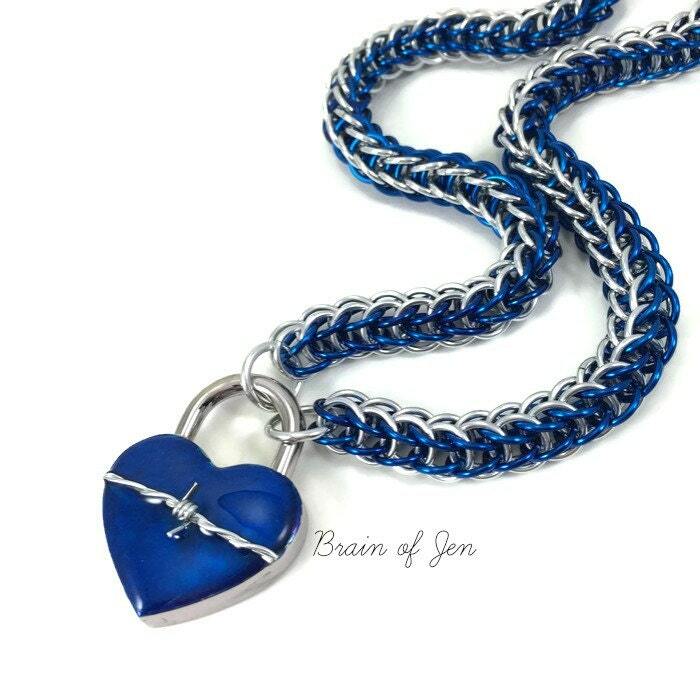 They will not tarnish, and clean up beautifully with just a little soap and water, so you can wear this collar daily, even in the shower, without worry. If nickel sensitivities are an issue, please let me know and I'd be happy to add a protective resin coating to the back of the lock at no extra charge! 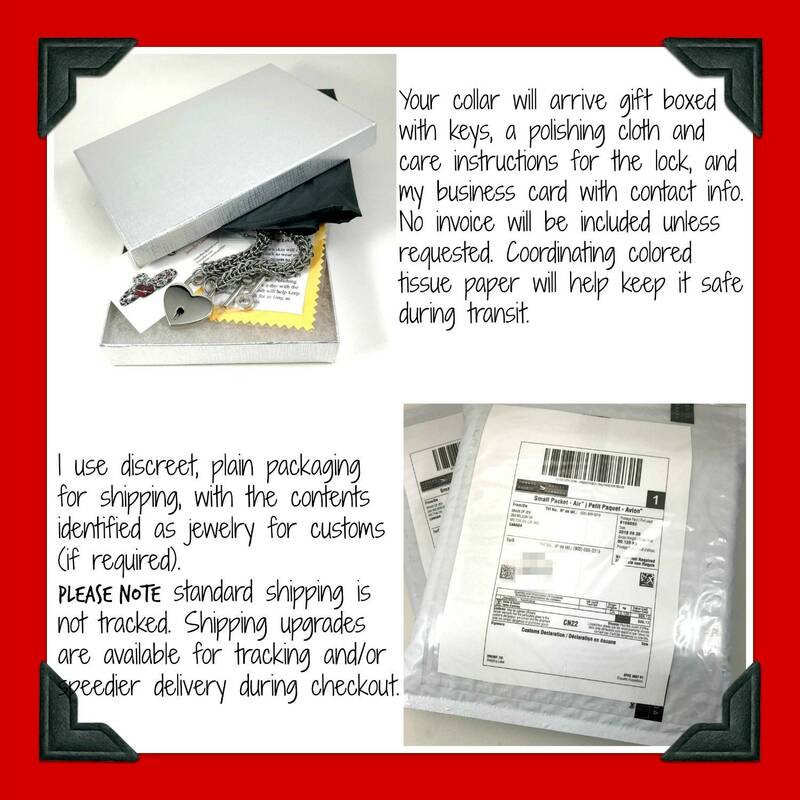 You must provide me with certain information to fulfill your order, such as your name, email address, postal address and the details of the product that you’re ordering. 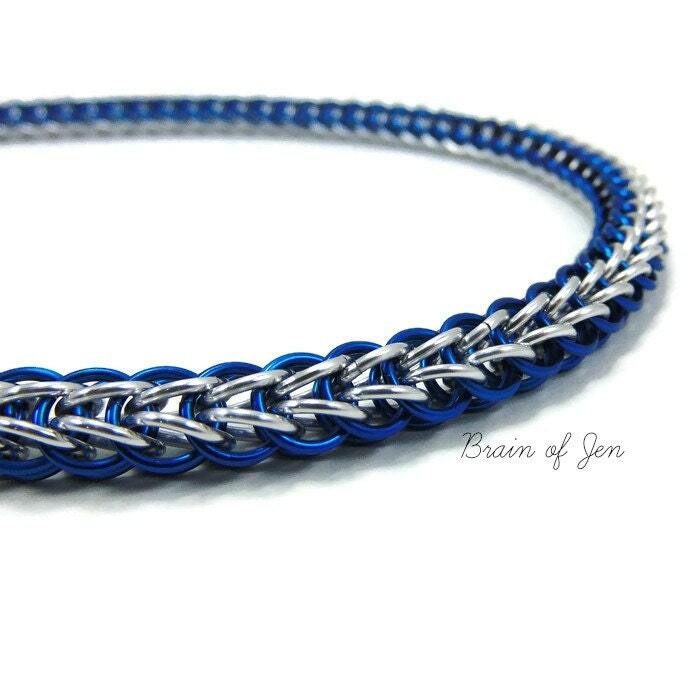 You may also choose to provide me with additional personal information (for example, to discuss custom orders), if you contact me directly. I do NOT retain, nor do I receive, your detailed payment information such as card number or billing address - only method of payment (eg. PayPal, credit card), and the amount paid as shown on your transaction receipt. Your contact information, such as email and shipping address, may be shared with third party services such as mail/delivery companies (eg. Canada Post, USPS, Royal Mail, FedEx or Purolator), but only as necessary to provide you with their services to ensure timely delivery of your product. I’ve ordered several products from this shop and everything is awesome! Thank you!!!! Exactly as pictured. I upgraded to the silver lock (metal issues for her). The weight is perfect. 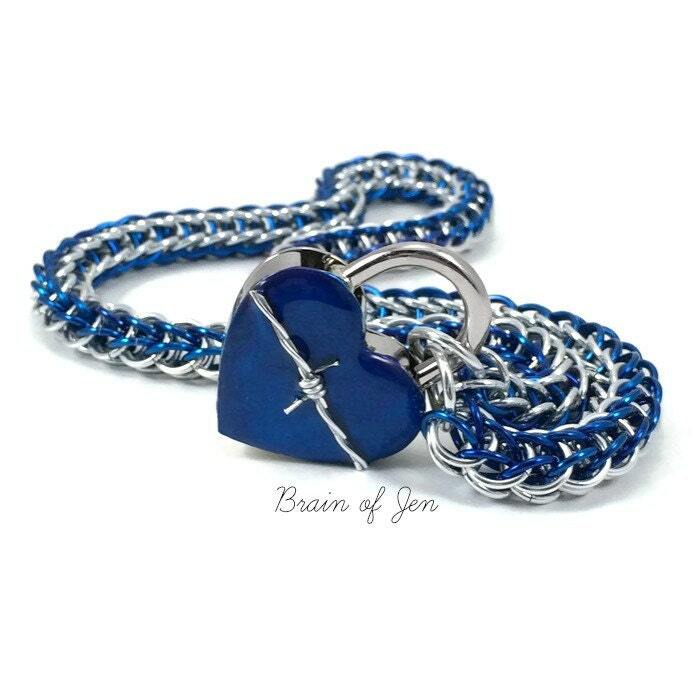 The chain is eye catching as is the lock. Couldn't be happier. Thank you! Shipping was quick and easy. Seller is very accommodating and answered all questions that I had.